Friday morning, Witchlette woke before her alarm and skipped into our room, saw me at my altar, and came right over to join in the beginning of my morning session. We started with the elemental call song, singing each line once as we lit each of the four candles and continuing it three more times before lighting the center spirit candle to connect them all. I then lit both of the deity candles. I played a song and we meditated together, holding hands. After the song, Witchlette asked to pull Runes as she had a question: Why did Odin hang himself from the World Tree? After her reading, I extinguished the deity candles and allowed her to extinguish the element candles. Thank you earth for the plants, flowers and trees. Blessed be. Thank you air for the wind, storms, and clouds. Blessed be. Thank you fire for the camp fires, fireplaces, and outside fires. Blessed be. Thank you water for the rain, rivers, and oceans. Blessed be. Thank you spirit for all the men, women, and children and all the living things on the earth. Blessed be. My first divination practice was tarot. They eventually made it to my altar, which is by the window, and some of them got sunbleached, so I decided to spring for another set. This one was the Moon Garden cards. I liked the first book better, so I used the explaination book from yhe first set with the second card set. Eventually I changed over to the second book. Then Witchlette came along, and I did not toddler-proof my altar so while she was enjoying a morning of doing Blessed Be, she got into my cards and spread them all over the house. All the while, I was only using the Major Arcana to do readings because much as I tried to spread my focus to a whole deck, I just couldn’t do it. Then, as I got to know more Tarot readers, I began to feel that I was doing it wrong. (Note- no one ever told me this; this is a conclusion I made). And so, I put the cards aside partly because some are still being found three years later and partly because I didn’t feel comfortable with it any longer. 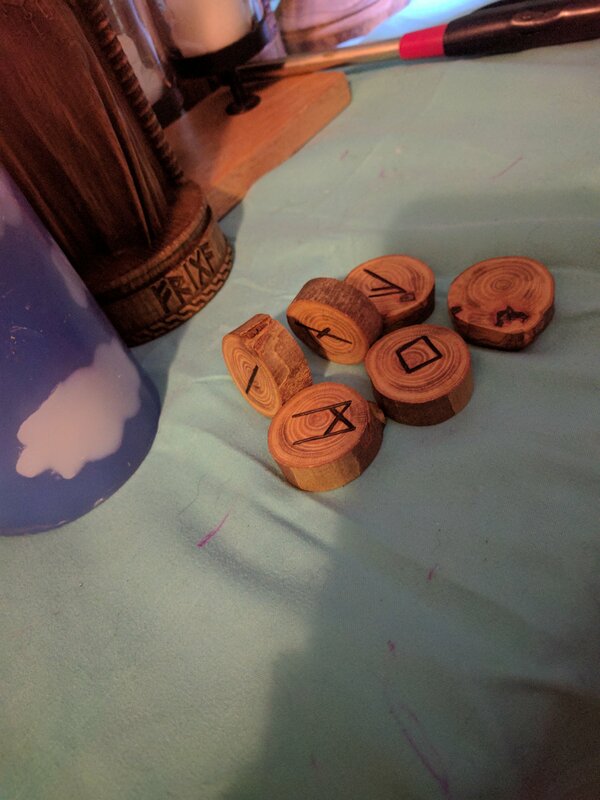 On an impulse purchase at Pagan Pride 2014, I got a set of Runes made by my local “Rune Guy” after getting a really positive reading from him about having more children after Witchlette. (Witchling was born the following PPD weekend!) I had them, and I had books to go with them, but I was afraid to use them. 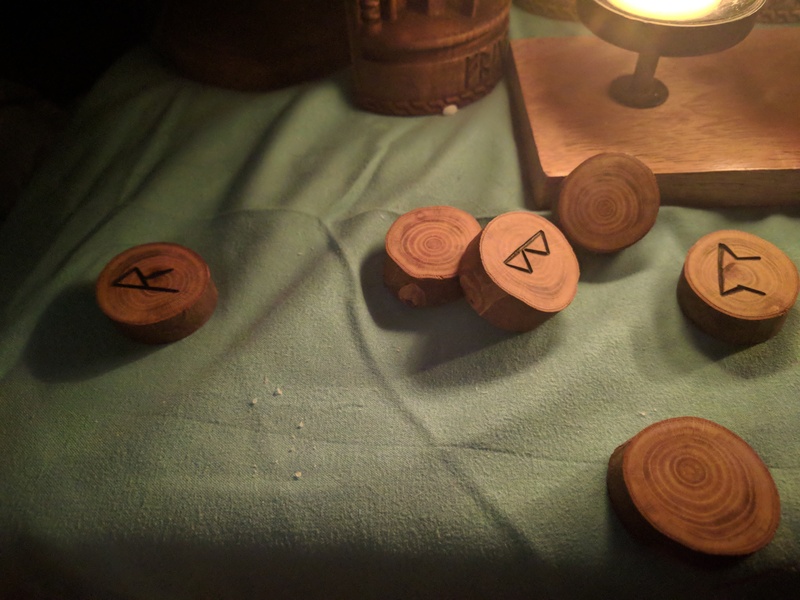 Granted, at this point, I was afraid of the Aesir in general… I “knew” I had to master the Runes before I could use them for Magick and divination. This past Yule, I asked for and received Witch’s Tarot. I started using the whole deck and while doing a reading takes me a bit as I have to go through the whole book, I like the way the whole deck feels. In the past few months, I started my Rune study again but felt again as I wasn’t getting anywhere. I decided, given my now open and growing relationship with the Aesir and Vanir, I could use practice to learn. Learn while doing, especially since I retain a lot more that way. I now have most of the Elder Futhark memorized and I am able to complete divination for myself and others with confidence. 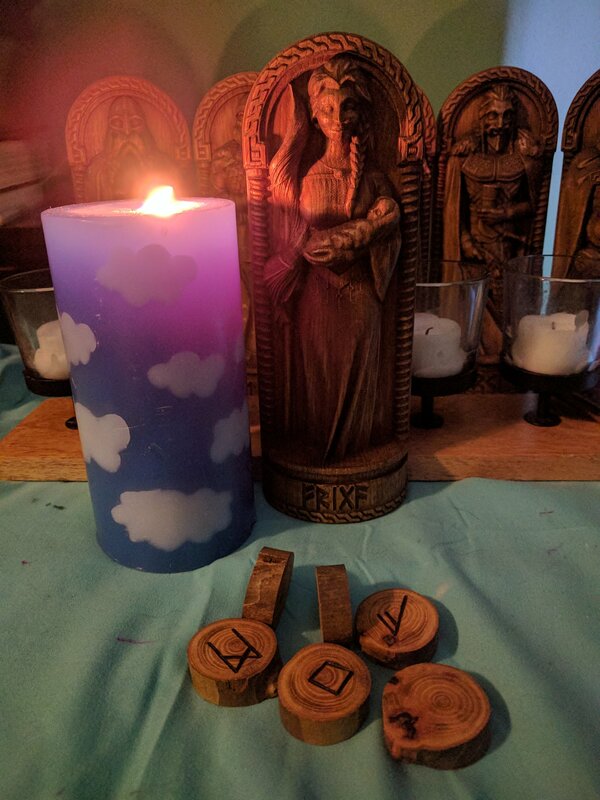 I like using the language of Frigg to complete divination, it makes me feel closer to her. I also didn’t trade out something I was already using for the Runes. I still do Tarot, but I’m more comfortable and confident with the Runes. And I am able to feel like I’m gaining mastery of them since there is an alphabet of Runes versus a five-suit deck of cards (counting Major as another deck). The first challenge for Magical Roots is to complete divination in a preferred form, which is Runes, to find what my focus for the month is. I think I cheated because I jumped onto my viewpoint as soon as I read about the challenge. I have a need for enlightenment and I am stagnating myself from my personal growth because of my confusion. My confusion is about incorperating Frigg into my pre-established practice and incorperating her practice into mine. Gebo has been popping up in my life a lot lately. An exchange; a gift, usually for a gift. A gift for a gift. If I want Eir to partake on the ritual I wrote, I would have to provide an offering to her. Should I need to utilize that spell, or one like it in the future, I plan to involve a check-writing portion for a local children’s hospital. Eir, goddess of healing, would want to support other healers. Yesterday afternoon, I did a rune reading. I had been feeling like I needed to do things the “right” way and while I still was going with my UPG ways, I was still looking for the “right” ways. 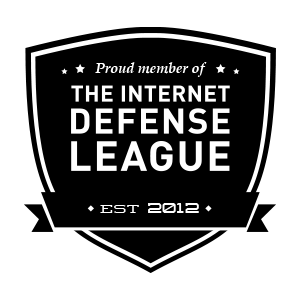 The right words, the right symbols, the right libations- all the while ignoring my own advice of intent first. The runes set me straight. All together: put forth the time and efforts and connection will follow. A gift for a gift. Time and attention for time and attention. No right, no wrong. Just do it. I committed to writing 30 posts about Druidry at the end of June. It is now the beginning of October. I’m only on number 14. While I committed to writing the posts, I never committed to writing them on consecutive days. While writing the post about the deities/important figures, I started to think more of myself as a theist. I spend a lot of time thinking about the deities of the Norse pantheon. I have for quite some time now, but I always ignored whatever message I was being sent. Then PPD happened and I went there. I opened that door wide. I have since started to make my way through. I guess I always knew I would end up here sooner or later, but there are too many [silly] reasons why I pushed back. To hell with those [silly] reasons. So, while I think writing about Druidry was important because it helped me to get there, I don’t think it is where I was supposed to be. Maybe it is where I’ll end up later, but not right now. For now, I will be leaving 30DOD unfinished. Maybe one day, but not right now. As I have written before, I am not abandoning things en masse I have been taking into my practice for some time now. I am just evolving. Life is nothing if not change. And so I am righting my course in the direction which I was turned towards for so long, but which I fought tooth and nail to get away from. I am now embracing that current and enjoying the ride. I have felt the pull from a deity for quite some time now, which has evolved my stance on them. For the longest time, I thought there weren’t any. There is an ultimate energy in the whole of the Universe, and the deities are just aspects of that energy. In a large scale, that is still true. Hell, all of us are just aspects of the energy of the Universe. Deities, like us, are separate entities. And one of them was trying to reach out to me, but I wasn’t willing to answer. Since I have started studying this deity (baby steps, I want to know all that I can before I start working with him) things have clicked and have just felt right. There is not much that remains in the lore about him. From what little information we have, we know he was at one point of high importance but began to lose popularity along the way. Just to say and think his name feels right. The Heathen teacher that I met at PPD, who helped me kickstart this leg of my journey, shared that the best way to begin a path of Heathenry is through the Runes. 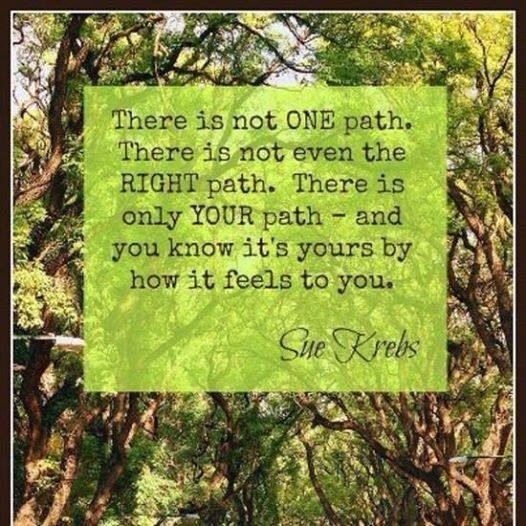 They are the key to open the door down this path. Three (or more) Yules ago, I was given a Rune study book. You know how books, or anything else for that matter, that sit for a long while without being touched develop that filmy layer of dust? Never happened to this book despite the fact that I wasn’t ready for it then. I’m ready for it now, and it waited patiently for me. I have studied two Runes so far, Fehu and Urus, working with one Rune per week. My studies will bring me to early March. Unlike 30 days, I have committed myself to daily study and work. I read the chapter from my book. I meditate holding the Rune, inscribe the Rune on each palm with my finger, writing out phonetic paragraphs with Runes instead of letters, adding a new symbol each week. During random moments of the day, I stop and recite each Rune and it’s translative meaning. Fehu- wealth, cattle. Urus- potential energy, fortunate catalyst. I have felt a really strong pull at my crown chakra during Rune meditation while holding it in my palm and while inscribing the Rune into my palm with my finger. This is just right. Something within me changed. Since that day, something feels smoother. To go back to my boat metaphor- I am able to unfurl my sails and travel wherever the wind and the current takes me and just enjoy the journey since I am no longer intimidated by the potential destination. The only way to avoid stagnation is change. The only way to grow into one’s potential and to fulfill one’s destiny is to change. The biggest change comes from my stance of spiritual atheist elemental. The atheist perspective has been wavering for a while now, especially as the pulls from a certain Thunderer become stronger. My most recent druidry exploration was Thor-centric. I’ve been intrigued by the Norse pantheon since almost the get-go, but I didn’t explore it further because it wasn’t for me. I read and re-read translations of the Eddas. But I didn’t explore it further because it wasn’t for me. I felt I had more of a “right” to feel a connection to the pantheon as I learned, while I was preparing lesson plans for Beowulf a few years back, that Viking remains were found across Ireland, my main trace of ancestry. Plus I’m German. And Swedish. But I didn’t explore it further because it wasn’t for me. 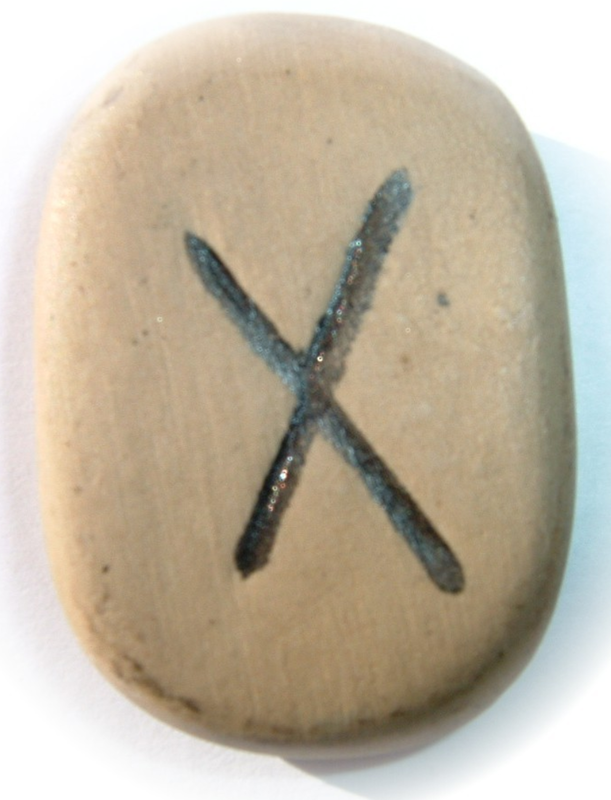 I have always been interested in the runes and picking up the runes as a form of divination. I have a set made from clay and a set made from amethyst. I have a few books…good, quality books. But I never actually went through with it because it wasn’t for me. Again…anyone notice a pattern here? So I had been feeling this tug. This big pull. By some one. At Pagan Pride yesterday, I met a time reader who I instantly connected with. I asked him a straightforward question that also had deeper meaning. He answered it plainly and when I discussed the deeper meaning and how I instantly understood what he was telling me he said yes, what I am interpreting is what he is seeing. I realized while I had gotten a great answer to a big question, I asked the wrong question. So I sought him out again today. Is there a deity trying to contact me? Yes, there is. And he is a Norse deity, but it’s not Thor. It’s actually an obscure deity with very little written history remaining. It’s a deity who was a major deity at one point, but has been lost to time. A list of what is known about him is misunderstood or misinterpreted. Later in the day, I sought out the reader again and asked a follow-up question: Will it be beneficial to me to go forward with this deity, to make contact with him? The rune for the right path, the way to go, appeared. A solid yes. 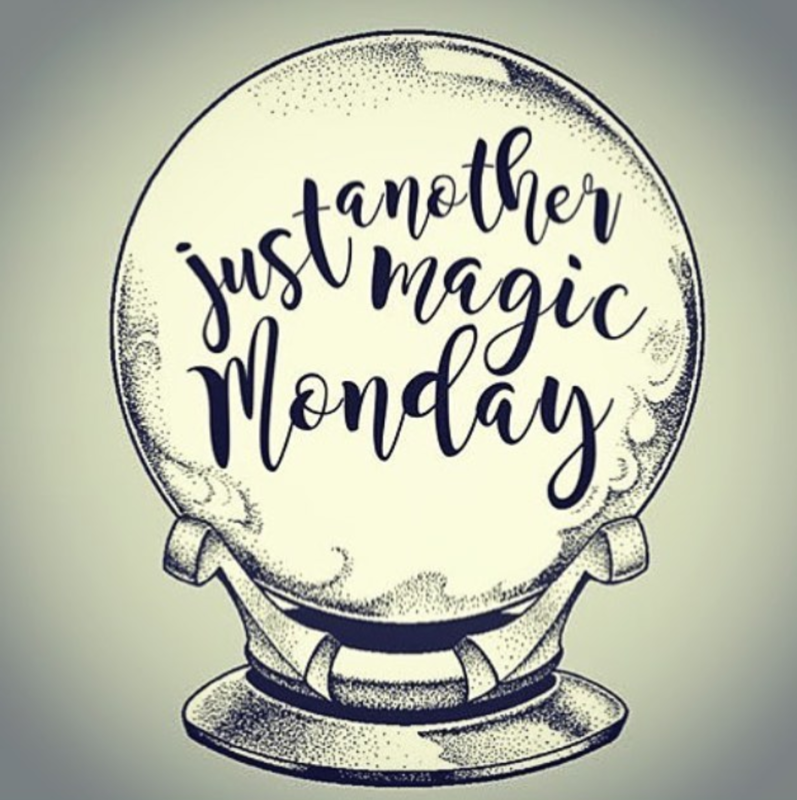 It won’t be easy, and it will be different and I could be seeing and experiencing some things that I have never thought to be true, but it’s the way to go. I felt the cosmic tap on the shoulder one too many times. I’m glad I asked before I got hit with the cosmic 2×4. Tonight, I will be beginning my studies of the runes. Every night for a week I will devote some time to each rune. I will also be working on my shielding and cleansing. The whole ride home, everything feels right. I get a tingle in my crown chakra when I say his name. The little that I have read of him tonight…it seems like all of my various interests, fulfilled or only contemplated from afar, throughout my whole life, are sitting at his feet. I am going to explore this, because I think it’s for me. Change is good, but it isn’t easy. But, if it’s not hard, it’s not worth it.